Dr. William W. Winnie Jr. (1928-1988) was an American geographer who lived in Ajijic with his wife – the archaeologist Dr. Betty Bell – in the early 1970s. 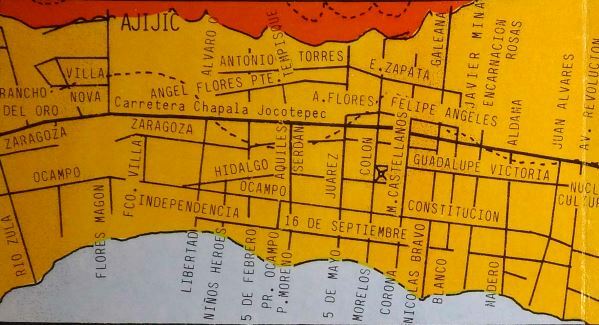 Winnie published several papers relating to Guadalajara and western Mexico and also produced a map of Lake Chapala towns. The map, which was widely-distributed, was the earliest attempt to show the entire Lakeside area in a general purpose map for the public that I have so far come across. Winnie and Bell were also instrumental in founding the short-lived Ajijic museum of archaeology and the Sociedad de Estudios Avanzados del Occidente de México, A.C. (The West Mexican Society for Advanced Study). William W Winnie Jr., known simply as “Winnie” to his friends, was born in Pontiac, Michigan, on 27 January 1928. He moved to Alburquerque, New Mexico, at the age of 21 to undertake pre-medical studies but transferred to the University of Florida two years later to complete an undergraduate degree in geography. He remained in Florida to gain a masters in sociology and a doctorate in Latin American studies. His doctoral thesis (1956) was based on fieldwork in Mexico and entitled “The Lower Papaloapan Basin: Land and People”. It was the beginning of a long love affair with the country, its geography and its people. Winnie subsequently published the results of his doctorate work as The Papaloapan Project: An Experiment in Tropical Development (1958) while working as a Social Science Analyst in the U.S. Census Bureau. By 1960, he was back in Mexico, on the faculty of the University of Nuevo León. That year he published an interesting short article about the significance of Spanish surnames in the southwestern U.S. The following year he published an article about land tenure in the Papaloapan basin. Winnie was a Fulbright Lecturer at the University of Chile in 1963-4 and published an article in 1965 on “Communal Land Tenure in Chile”. He returned to the U.S. for the 1964-5 academic year as a Postdoctoral Research Scholar in the Department of Geography at the University of California, Los Angeles, where he worked on a project sponsored by the Organization of American States and the Peace Corps. This was the basis for his 1967 book entitled Latin American development; theoretical, sectoral, and operational approaches. This stimulated his interest in population migration, a topic that would continue to hold his attention for many years. His first formal publication related to migration, published in 1965, was about inter-state migration in Mexico. Sponsored by the Fulbright Program, Winnie took up a position as visiting professor in the Economics faculty of the University of Guadalajara in 1970. This more or less marked the start of the university’s interest in social science research. Long term goals for research were established in 1971 with the creation of the university’s Centro de Investigaciones Sociales y Económicas (CISE). Early work at CISE was financed almost entirely by external grants. Winnie was a pioneer in the demographic study of western Mexico and with fellow university researchers Jesús Arroyo Alejandre, Enrique Rojas Díaz and Luis Arturo Velázquez established a successful program of social science teaching and research at the U. de G.’s Economics Faculty. After completing their undergraduate degree, many of the students undertook further studies, some in Mexico and others abroad. Winnie established close links to other important academic institutions, including the Colegio de México, the Colegio de Michoacán, the Colegio de la Frontera Norte, and the University of Texas at Austin. The precise dates of their residence in Ajijic (at Calle Colón #36) are unclear, but Winnie and his wife Betty Bell made many significant contributions to village life. 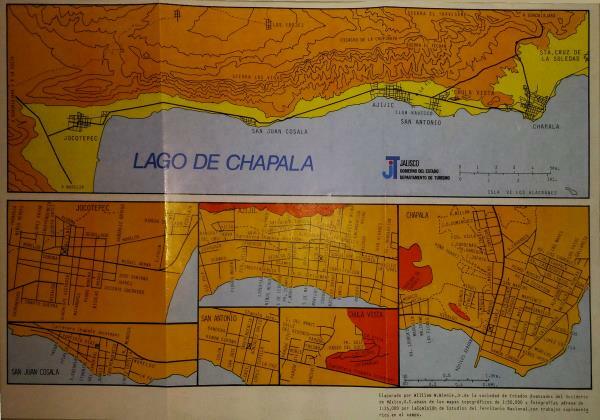 Recognizing that street maps of the local villages were almost impossible to find, Winnie drew his own maps of the Lake Chapala area. With their very simple, single line streets, they are very different to the style of the graphic map-poster of Ajijic designed by Molly Heneghan, though both maps were first printed at about the same time. In 1971, Winnie and his wife helped start an Ajijic Museum of Archaeology and founded the Sociedad de Estudios Avanzados del Occidente de Mexico A.C. (West Mexican Society for Advanced Study). The museum was located on the highway, adjacent to where the Auditorio de la Ribera (Lake Chapala Auditorium) was later built. Following a change of law pertaining to archaeological investigations, the museum was closed by Mexican authorities in about 1974, and the West Mexican Society for Advanced Study, whose prime purpose was to encourage the participation of foreign archaeologists in Mexican projects, closed shortly afterwards. Shortly before the Society closed, and under its auspices, Winnie and Bell organized a visiting group of students in 1974. The weekly English language newspaper in Guadalajara reported that 25 students from Angelo State University in San Angelo, Texas, were spending three weeks at Lake Chapala taking college-level classes for credit. The classes, coordinated by Winnie and his wife, were given by Angelo State faculty members Caroline Haley and Tony Dutton. They included Spanish-language classes connected to Mexican civilization and literature, and classes about the anthropology of pre-Columbian cultures in Western Mexico. The program was well received by local people, with the Chapala mayor hosting a special dinner to celebrate the first program of its kind in the area. Winnie’s contributions to Ajijic life were not only connected to his academic interests. In 1974, he was on the committee responsible for planning the construction of the Auditorio de la Ribera (Lake Chapala Auditorium) . Other members of the initial committee included Enid McDonald (the Canadian flying pioneer who spearheaded the local fund raising campaign), Hector Marquez, Manuel Pantoja, and Josephine Warren (mother of Chris Luhnow who founded the long-running Traveler’s Guide to Mexico). According to his colleague Jesús Arroyo Alejandre, Winnie’s most productive period at the University of Guadalajara was between 1979 and 1982. 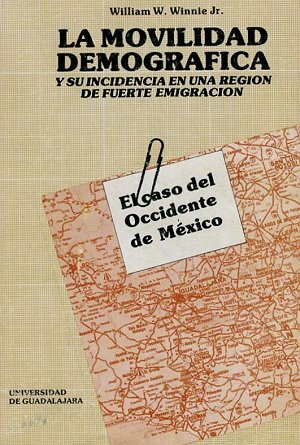 His research during that period resulted in a landmark book about migration in western Mexico: La movilidad demográfica y su incidencia en una región de fuerte emigración: el caso del Occidente de México. Winnie remained on the faculty of the University of Guadalajara until his death at the age of 59 on 17 January 1988. He was interred as a U.S. Veteran in the Fort Sam Houston National Cemetery in San Antonio, Texas. William W. Winnie Jr. 1958. “The Papaloapan Project: An Experiment in Tropical Development”. Economic Geography, Vol. 34, #3, 1958. William W. Winnie Jr. 1960. (May 1960). “The Spanish Surname Criterion for Identifying Hispanos in the Southwestern United States: A Preliminary Evaluation”, Social Forces, vol 38 #4, May 1960, pp. 363–366. Oxford University Press. William W. Winnie Jr. 1961. “La tenencia de la tierra en la Cuenca del Bajo Papaloapan” in HUMANITAS: Anuario del Centro de Estudios Humanísticos. El Centro de Estudios Humanísticos de la Universidad de Nuevo León. 1961 #2, 601-616. William W. Winnie Jr. 1965. “Communal Land Tenure in Chile”, Annals of the Association of American Geographers, Vol. 55, No. 1 (Mar., 1965), pp. 67-86. William W. Winnie, Jr. 1965. Estimates of Interstate Migration in Mexico, 1950-1960: Data and Methods. (Reprinted from Antropologica no. 14, Caracas, June 1965). Latin American Center, University of California, Los Angeles. 22 pp. William W. Winnie Jr. 1967. Latin American development; theoretical, sectoral, and operational approaches. Latin American studies, vol 8. Los Angeles: Latin American Center, University of California. 255 pp. William W. Winnie Jr. 1982. “Variaciones regionales en la fecundidad y la migración en el Estado de Michoacán.” Relaciones (Colegio de Michoacán), vol III, no 10, pp 29-52. William W. Winnie Jr. 1984. La movilidad demográfica y su influencia en una región de fuerte emigración. El caso del Occidente de México. Universidad de Guadalajara, Jal. William W. Winnie Jr., John F. Stegner and Joseph P. Kopachevsky. 1970. Persons of Mexican descent in the United States. Fort Collins: Center for Latin American Studies, Colorado State University. 78 pp. William W. Winnie Jr. and Jesus Arroyo Alejandre (coords.) 1979. La migración en el estado de Jalisco y la zona metropolitana de Guadalajara. Guadalajara: Universidad de Guadalajara, Facultad de Economía, Centro de Investigaciones Sociales y Económicas. 181 pp. Jesús Arroyo Alejandre. 1988. “William W. Winnie Brown, pionero de la investigación demográfica en el Occidente de México” (Obituary), Relaciones 34, primavera 1988, vol. IX, pp 145-147. Colegio de Michoacán. Guadalajara Reporter. 18 May 1974; 22 June 1974.